Ballina have won five-out-of-five in the Connacht Junior League this season so far. Photo: Ballina RFC. Ballina's win came thanks to tries from seven different players, with Conor Mason, Aiden McNulty, Ronan Molloy, Sam Liebiwitz and Daniel Molloy all touching down once and Calum Quinn getting two tries over the 80 minutes. When the action returns to the field, Ballina will face a much sterner test when they host second placed Connemara in Heffernan Park. The All Blacks from southwest Galway are just three points behind Ballina in the table after their five games. Westport go into the break in sixth place in the table after they went down to their third defeat from four games last weekend against Connemara in Monastery Field. Eddie Walsh's side did come away from that trip with a losing bonus point as they went down 22-15 on the road. A first half try from Matt Dempsey saw the Bulls go in trailing 12-7 at the break and they were 10 points down with a quarter of the game left, but an Aidan Walsh along with a late penalty saw them close the gap back to just seven at the end. 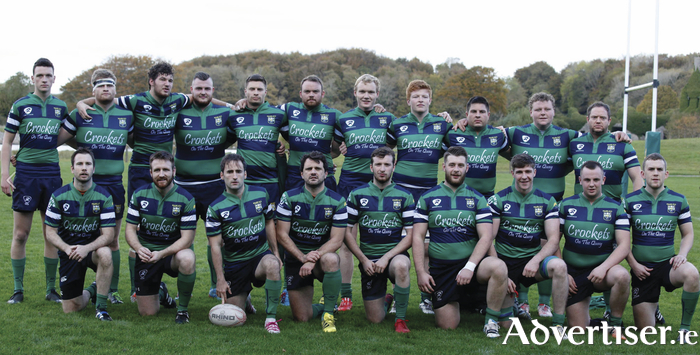 This weekend the Bulls are in action in the All Ireland Junior Cup when Ashbourne come calling to Carrowholly at 2.30pm on Saturday. In Division 1B of the Connacht Junior League, Castlebar fell to a 5-0 defeat on the road against Sligo in their fourth league game of the season. A try in the 15th minute by Sligo's Chris Morris was the defining score in the game. This weekend Castlebar are back in action when they host Creggs in Castlebar at 7.30pm. There are just two points between the sides in the table at this early stage, with Castlebar having four games under their belts and Creggs having three. A win for Castlebar is a must, even at this stage, as they look to make it into the reckoning later on for promotion back to the top flight. Ballinrobe slipped to their third defeat of the season in the division when Corinthians saw them off by 13 points on a score of 24-11 in Galway. Tom Lynagh crossed for a try after Oisin Gill had kicked two penalties to put the south Mayo men 11-0 up early in the second half, but the city side hit back with 24 unanswered points down the home stretch to grab the win. The other Mayo side in the division last weekend, Ballyahunis, slumped to their fourth loss in a row with Tuam seeing them off 17-0 in north Galway, the east Mayo men are still looking for their maiden win this season in the league. This weekend Ballinrobe entertain Loughrea and Ballyhaunis host Sligo.